A retired lieutenant colonel, who was said to have led the Boko Haram attacks on Damaturu, Yobe State, on Thursday was arrested by security forces during the encounter. The retired army officer is being detained at a military facility. It could not be ascertained as of the time of filing this report if he has been moved to Abuja for interrogation or not. The Director of Army Public Relations, Brig. 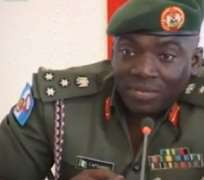 Gen. Ibrahim, had put the casualty figure on the part of the insurgents at 70 in a statement that was silent on the number of soldiers killed in the attack. It was however, learnt that nine soldiers including a lieutenant and four policemen lost their lives in the attack. 'The retired lieutenant colonel was properly discharged from the Army and it was a big surprise when he was arrested and identified by those who knew him as a former officer,' an Army source said. It was further learnt that the attack on security formations in Damaturu was to avenge the seizure of a truck containing military uniforms and arms by security forces. The truck was seized last week when the driver objected to a search of the vehicle and he tendered a memo purportedly from the Defence Headquarters directing that the truck should not be searched. The driver and other passengers were detained and the truck was impounded and parked at the Police Area Command, Guija Road, Damaturu, when the army camouflage and weapons were found inside it. SUNDAY PUNCH further gathered that members of the sect are holding a medical doctor who was abducted while on duty at the Sani Abacha Hospital during the Thursday attack. They also carted away drugs that were in the pharmacy of the medical facility and took away two ambulances belonging to the Damaturu General Hospital. Security operatives are said to be looking for the doctor who is feared to have been taken to one of the enclaves of the sect in the North-East. A security source said on Saturday that the Boko Haram members might have taken away the drugs for the purpose of giving medication to injured fighters of the group while the medical doctor might have been seized for the purpose of rendering medication to their injured members. Meanwhile, the military on Saturday relaxed the 24 hours curfew imposed on Yobe State to nine hours. When our correspondent contacted the Director of Defence Information, Brig. Gen. Chris Olukolade, he said, 'Whatever you call it, we are capable of dealing with it decisively.